Two thirds of Munster's front-row. Guess the odd one out. 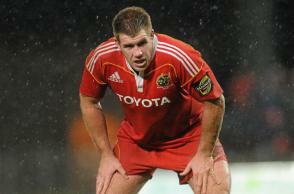 Tony McGahan leaves Munster at the end of the season. Over the last couple of years he has seen the province through a particularly tricky rebuilding phase, and while it’s not yet complete, The Mole thinks that the body of the work has been done. However, the prop situation at the province seems to be a bit of a timebomb. Munster are further down the road of NIQ props than a casual observer may recognise: while this is BJ Botha’s first season as tighthead solution, Wian du Preez has played sixty games for the province over the last two and a half years. Munster haven’t started an Irish qualified prop in the Heineken Cup this year, and with John Hayes retired and Tony ‘Mushy’ Buckley having left for Sale, the last time that a currently-contracted, Irish-qualified Munster prop started a European game was back in early May 2010, when Marcus Horan started against Biarritz in the semi-final at the Stade Anoeta in San Sebastian. 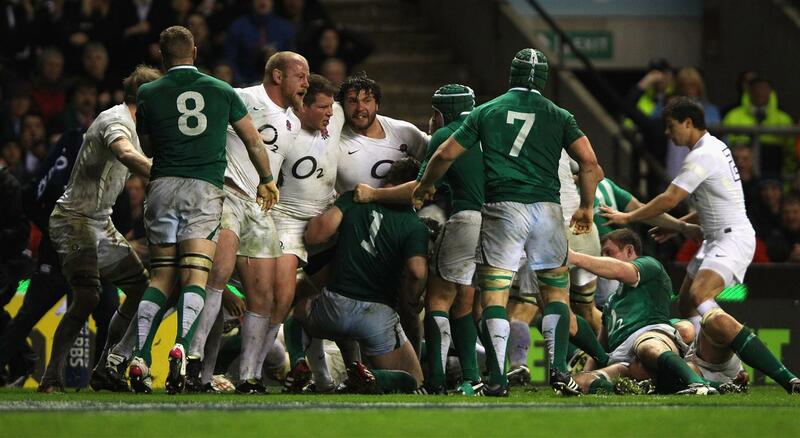 The English demolished the Irish scrum on St Patrick's Day – tough times at tighthead for Tom Court. Maybe it was a perfect storm: a resurgent england at home in Twickenham, four matches on the trot for Ireland and Court having to come in early on the wrong side for him. However, it was a spectacle that had some Irish rugby fans reconsidering their take on the IRFU's dictat regarding NIQ players at the provinces. The mood in the IRFU has turned decisively against the provincial reliance on NIQs to cover front-row [and especially tighthead] inadequacies. The huge difficulties experienced by Australian-born Ulster loosehead Tom Court when asked to fill in at tighthead against England constituted a worst case scenario come to pass: a tired Irish scrum was utterly demolished by a confident and aggressive English pack, and the national team and coaching staff ended the championship humiliated on foreign soil. Now, it’s not immaterial that the international game still demands a seven-man bench, which requires a prop who can can cover both sides at the highest level, while every other professional competition in the northern hemisphere mandates an eight-man, two-prop bench. It’s an anachronism, but those are the rules. 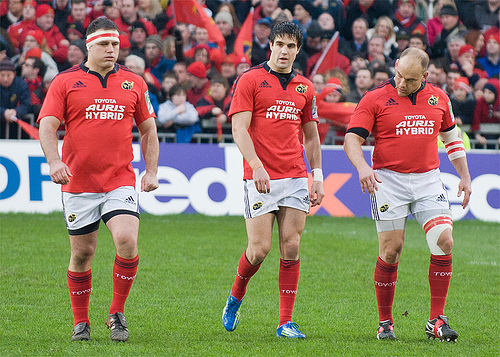 Halfway through the 2010-11 season, Mike Ross was installed at Leinster, Jamie Hagan had locked down the tighthead berth at Connacht, Tony Buckley and John Hayes were still swapping in and out for Munster and while BJ Botha was the first-choice tighthead at Ulster, both Declan Fitzpatrick and Tom Court had started Heineken Cup games in the white No3 shirt. Three first-choice Irish tightheads at three of the provinces, and a pair of props getting some decent gametime in the position in the other one. Fast forward to the start of next season, and it’s entirely likely that Afoa will start all Ulster’s major matches, that Botha will start all of Munster’s HEC games and that Kiwi Nathan White [who makes the move from Leinster to Connacht this summer and has been designated a ‘project player’, qualifying for Ireland through residency in September 2013] will take the No3 jersey away from incumbent Ronan Loughney. That will be three first-choice non-Irish qualified tightheads out of four in provincial rugby. Afoa has been magnificent for Ulster this season, but this is Ulster's fourth season in a row where the tighthead position has been dominated by a foreign international. In a game as position-specific as rugby, and in provinces that are heavily funded by the union, there's an obvious conflict of interests there. The irony is , of course, that Ulster have fewer NIQ front-rowers than any other province – Afoa is the only one, while Leinster have Strauss, van der Merwe and White, Munster have Botha, Borlase and du Preez and Connacht have Reynecke, Ah You and Rogers. The PCRG [Professional Contracts Review Group] of the IRFU has a veto on every single contract that comes in front of them. After three seasons of BJ Botha at tighthead, they were the ones responsible for rubber-stamping Ulster’s two-year deal for John Afoa. Afoa is an absolutely cracking player who brings a hell of a lot to the table, and it’s doubtful whether Ulster could have got through a Heineken Cup group with such strong-scrummaging teams without him, but five years straight is a long time not to play an Irish-qualified player in a specialist position at the highest level of club rugby. In terms of their contribution to the national team, it’s a serious issue. Leinster went through a similar phase midway through the last decade. Emmet Byrne hung up the boots at the end of the 2005-06 season, and former English international Will Green saw heavy usage in both that season and the next [he put in 43 starts over two seasons], before first Stan Wright and then CJ van der Linde took their turn in the blue No3 jersey. For a World Cup-winner, van der Linde was a disaster of a signing; nothing seemed to work out for him. 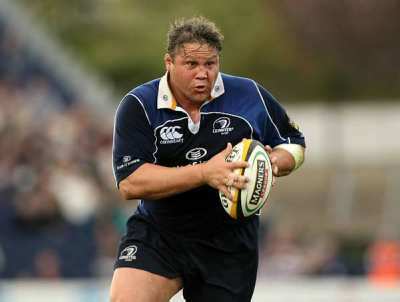 Stan Wright was a huge success however, coming from an extremely low base of physical preparation and technique to become one of Leinster’s stand-out players and probably the best prop in the country in the 2009-10 season. Reggie Corrigan’s legs finally gave out when he turned 36 in the 2006-07 season and he was mostly used as a substitute, starting just six times but coming off the bench in fourteen other matches. The well-travelled Ronnie McCormack had come back into the fold and taken over a lot of the heavy lifting at that stage, and it’s tempting to look at the one season that Ollie le Roux spent at Leinster [2007-08] as nothing more than a placeholder between the time that Corrigan retired and Cian Healy emerged. However, le Roux had an unexpectedly massive influence on Leinster’s tight play, and seemed to do an awful lot of good work in terms of his on-pitch performances, his training ground efforts at scrum-time and his mentoring of Healy. Many Leinster fans expected Ollie le Roux to be a washed-up disappointment looking for a payday at the end of a distinguished international career. Instead he brought huge energy to everything he did and added enormous value to the club. Despite his enormous size, he was both quick-footed in contact and well able to play the full 80 mins week after week. In many ways, his stint was the absolute ideal of what the IRFU want from an NIQ player: come in on a short contract, take young players in your position under your wing, make a valuable contribution off the field as much as on it and then hit the road again before you become a fixture. However, circumstances dictate to a large extent just how much of an impact any player can have off the pitch, and the provinces primarily want their players to be at their best when they’re playing, not merely being good skins in the clubhouse and hard workers on the training pitch. As much as internationally experienced foreigners have to teach young Irish players, there has to be efficient systems [scouting, recruitment, specialist positional and skill coaching] in place in order for those youngsters concerned to fully benefit. Leinster seem to have more or less turned their scrummaging problems around over the last three or four years. A huge proportion of the Irish U20 props over that period have come from Leinster, and there’s a heavy emphasis on recruiting Irish-qualified props to the provincial set-up, both via the academy and through senior contracts. With the announcement of the signing from the Wellington Hurricanes of Irish-qualified New Zealander Michael Bent, Leinster will have at least seven Irish-qualified tightheads [or props capable of playing tighthead] on their books next season: Ross, Hagan, Bent, McGrath [all senior contracts] and Jack O’Connell, Martin Moore and Tadgh Furlong [all on academy contracts]. 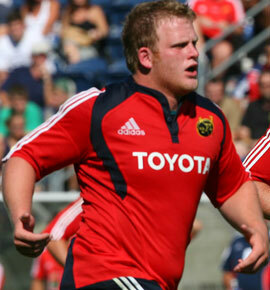 Munster deserve some leeway at tighthead. Having provided John Hayes to the national team for more than a decade, and attempted to produce an heir in Tony Buckley – a project that unfortunately has to be deemed a failure – it’s obvious that they have ‘done their bit’ at tighthead for the IRFU. The succession strategy hasn’t worked out like they had hoped it would, and it was ultimately the right call to cut the cord with Buckley, even though a huge amount of time and effort had been invested in him. The returns simply weren’t forthcoming, and his efforts at Sale haven’t made the decision seem foolish. His inadequacies as a scrummager meant that Hayes had to play on longer than would have been ideal, and with the two of them on central contracts, there was simply no room for a third-choice tighthead to progress. It’s not as though Munster haven’t brought in NIQ props before: aside from current employees Botha, du Preez and Borlase, they’ve started French international Julien Brugnaut [09-10] and Puma Freddie Pucciariello [05-09] in recent times, and Scottish international Gordon McIlwham was a feature before Puc. However, with Hayes and Horan in situ, these players were never heavily relied upon in the Heineken Cup … this is in stark contrast to the almost total reliance on Botha [who has played 457 minutes of a possible 480 in the HEC] and du Preez [who has played 434 out of 480]. The clock is ticking on the transition phase. Horan turns 35 at the kick-off of next season and is a player seriously in decline; his contributions to the game last Saturday consisted almost entirely of collapsing the scrum, and a referee with more cop-on – and one who’s less of a homeowner, frankly – would have had him off the pitch a lot sooner. Signing a one-year contract is an iffy call from Munster: between himself and du Preez, they’ve started every single one of Munster’s games this year, and when your first choice is an NIQ who’s entering into the last year of his contract, and your second choice is a 35-year old who is on a serious slide, your succession-planning is in the toilet. Hurley had a very encouraging start to his pro career back, but has suffered injury after injury in the last five seasons, and his rate of progress has stalled badly. 23-year old Academy prop Dave Kilcoyne has only played eleven minutes of Pro12 rugby in his career to date, and seems to be the third in line for the loosehead position. There’s got to be huge questions over Darragh Hurley’s future as a professional rugby player, with just five starts in the last five seasons. He hasn’t been available for selection all year long, and injury problems aren’t just keeping him off the playing pitch, but also out of training. If he returns next year, he’ll have huge ground to make up … but maybe he’s simply not cut out for life as a professional prop. The demands on your durability are immense, and he seems unlucky and/or fragile. The situation is scarcely any better at tighthead. Behind Botha, there’s 24-year old Stephen Archer [who has improved a lot this season, but is still not a reliable scrummager at Pro 12 level], and then 23-year old John Ryan, who is in his first year on a senior contract. Ryan is quite highly rated, but then again every young prop comes into provincial squads quite highly rated: it’s when they start scrummaging against professionals that their mettle is tested. Ryan hasn’t started a game yet in his pro career and according to the Pro12 site has only played eighteen minutes in his four substitute appearances. Peter Borlase: maybe he's never going to be an international class tighthead, but it's not as though Munster are dripping with options. No long-term injuries have been made public, so what's the story with the former Canterbury tighthead? Then there’s the curious case of project player Peter Borlase, who hasn’t played a minute of rugby for Munster this season. Borlase has been an enormous disappointment since his arrival from Canterbury in November 2010, and it really doesn’t seem like he’s going to pan out. One school of thought is that he’s the last sting in the tail of the Munster school of scrummaging that tried simply to clone John Hayes: bring in physically big, tall men and hope that their scrummaging will improve by osmosis. First there was the aforementioned Tony Buckley, at 196cm [6’5″] and 130kg, then Timmy Ryan at 193cm [6’4″] and 116kg [18st3lbs] and finally Borlase at 193cm [6’4″] and 118kg [18st8lbs] … unfortunately for Munster, scrummaging has moved away from enormous tightheads as the distance on engagement has reduced. It’s not just about loading up on the hit anymore. The other school of though would be that there’s a story behind his lack of appearances, that he’s not fitting into the Munster ethic or that he’s a Clinton Huppert/Juan Gomez-style disaster. It’d be interesting to know the skinny on that one. Munster won’t be able to rely on NIQ props for that much longer. Du Preez has already been there for the guts of two and a half seasons, and in the current climate the IRFU simply won’t allow Munster the luxury of two starting NIQ props after their standing contracts run out. This entry was posted in Opinion and tagged BJ Botha, Darragh Hurley-Burley, Dumper, John Afoa, Munster, Peter Borlase we hardly knew you, Tony McGahan, Wian du Preez by dementedmole. Bookmark the permalink.